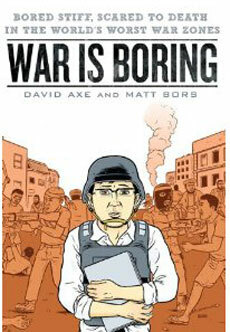 I just spent a few minutes writing about why I disliked the memoir War is Boring, by David Axe with art by Matt Bors. I figured maybe other people would like to read it. Mostly I found myself annoyed by the equanimity and detachment that the author presented toward places of incredible human suffering. Obviously a war correspondent becomes numb — as a matter of course — to the horrors of conflict. But it is this exact internal struggle that creates some of the best war reporting on the planet. (I’m thinking here of Robert Fisk, Amy Goodman, Allan Nairn, even Anderson Cooper.) I cannot recommend Joe Sacco enough for a superb example of a comics-artist war correspondent. I have no problem with war correspondents putting their own emotions — even if I disagree with them — into a story. The author of War is Boring, on the other hand, seems to represent the worst traits of 21st-century US ennui: Everything is just a re-run or a big yawn. It reminds me of this scene from My Dinner With Andre. Alas, rather than wrestling with this boredom, or interrogating its sources or the dangers it presents, the author chooses to wallow in it. As someone who has been deeply involved with human rights and international solidarity activism for nearly 20 years, I simply cannot sympathize with this view. There is so very much work we need to do to resist the constant needless suffering on the planet, and if the author believes that there’s nothing we can do to stop the sort of conflict he witnesses, then he is simply and factually wrong. And as someone who has written four novels and a wide variety of stories, autobiographical pieces, and other materials, I am strongly annoyed by the solipsistic nature of his book. If war (and therefore his life) is so boring, why write a book about it? As Saul Williams said: “Are your tales of reality worth their sonic-laced discussions?” It seems like the author here just kinda wanted to write a book, and he figured he had enough material to make it happen, so why not? But — again — what’s the point? What did he intend to illuminate about the nature of war (or war correspondence)? What does he want to say to his fellow humans about our condition on the planet? What is the intended takeaway? I consider it one of the rare few graphic novels that I seriously regret investing my time into. Anyway, this week’s show is all about Hooters (the restaurant), a pendulum named Elizabeth Warren, union thugs in Chicago, morons making movies as well as morons murdering because of movies, and robots making noodles. Enjoy!